Standard Pacific Homes started offering pet suites as an option earlier in 2014. Such suites, like this one in the Avignon model, can include a washing station that makes it easier to bathe pets. Photos below courtesy of the Austonian and Phil Kean Design Group, respectively. You could say some open houses are going to the dogs. At least that was the case for Standard Pacific Homes’ grand opening of a new community in Brea, Calif., where canines, as well as their humans, lined up to preview pet suites being offered as an option in the homes. Surprisingly, multifamily developers are leading the pet bandwagon. 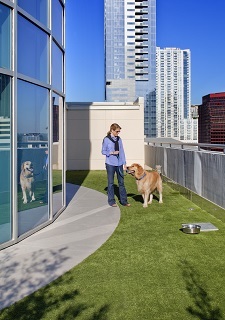 Understanding that many potential buyers would be moving from the suburbs, developers of the Austonian — a luxury high-rise building in downtown Austin that opened in 2010 — included a 600-square-foot dog park (and an indoor grooming salon) as part of an outdoor amenity area located on the 10th floor. Today in almost every urban setting, buildings, particularly luxury high rises, are including features and perks ranging from areas purposed for dog walking and dog parks to grooming studios to yappy hours and special events. Even new luxury rental buildings often incorporate grooming areas for pets as developers continue to refine ways to ensure their buildings match consumer expectations. “Today’s consumers have more pets than children,” says Mollie Carmichael, a principal with John Burns Real Estate Consulting, which provides independent housing research, advice and consulting. Approximately 68 percent of U.S. households own a pet, according to the American Pet Products Association. And dog parks are preferred over all the parks, even over children’s parks. “This is absolutely new,” says Carmichael. Earlier this year, national homebuilder Standard Pacific Homes introduced pet suites as an option in 27 of their 190 communities across the country, a first for a large residential builder. The concept grew out of livability studies conducted with homeowners. Danielle Tocco, Standard Pacific’s director of communications, says a theme that really resonated was how important pets are to families. In fact, the American Veterinary Medical society tells us that six out of 10 owners consider their pet to be a family member. Standard Pacific’s offerings range from a basic 50-square-foot suite — a separate room with an easy step-in wash station and storage cabinets — to an ultra-indulgent 170-square-foot space with customized cabinetry for toys, food and treats. Just in case Fido or Fifi gets bored, there is a flat-screen TV and a posh bed to stretch out on. Every suite incorporates lots of features that make it easier for homeowners to care for their pets, according to Tocco. “We are happy to be able to provide the suites as an option for owners. A lot of thought went into the space. It was a collaborative effort between our employees.” Prices for the pet suites range from about $8,000 to $30,000. All are separate rooms, which can be adapted to other uses if a future owner does not have a pet. Do Pets Really Need a Separate Space? Approximately 68 percent of U.S. households own a pet, according to the American Pet Products Association. And dog parks are preferred over all the parks, even kid’s parks. Grenadier Homes also began offering pet washing stations earlier this year. “Many of our buyers are empty nesters, retirees and singles who have pets that they love and think of as family,” says Kathy Costa, a Grenadier Homes design consultant. “They’re looking for homes that offer something special for their fur babies. Kitchen designers say they are getting more requests for spaces for pets, including niches for crates, beds, feeding dishes, even litter boxes, as well as for areas to organize food and accessories. The 2014 National Kitchen & Bath Association’s Kitchen & Bath Design Trends report singled out accommodating pets as a new trend. Individual manufacturers are also jumping into the pet arena. MTI Baths just introduced what is dubbed as “a dedicated bathing station,” available as a soaker or as a pet whirlpool. Extra insulation makes it quiet and integrated shelves store essentials such as towels, shampoo and treats. Kean says his most requested amenity is an electronic dog or cat door, which opens in response to a magnetic key on the pet’s collar and otherwise remains shut, keeping four-legged and other intruders out. Owners can program times to allow access for their pets. Each key is unique and owners can even view when their pet used the door. The ultimate amenity? Sutter says it’s an outdoor shower. Not surprisingly, Kean, an architect, says it is dog houses that match the architecture of the main house. For those who have a family member with special needs, a home that is accessible for them is vital for accomplishing daily tasks that many take for granted. Here’s what you should consider in order to successfully design a home that is accommodating to family members with special needs. A lush, well-maintained lawn can bring you plenty of joy, pride and quality time outdoors. Brand new lawns require a lot of work in the beginning, but it's worth it. Here's how you can get a great-looking lawn, whether you start it from seed or lay down sod.